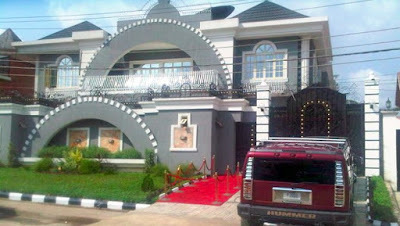 The popular ‘Squareville’ mansion in Lagos, home of embattled Psquare brothers, Paul and Peter Okoye, is up for sale. It appears the brothers, Peter, Paul and Jude Okoye have finally decided to sell all their joint properties and perhaps split the money, so they can finally go their separate ways. The mansion is a symbolic and historic structure for the Okoye brothers because it signifies the beginning of the singers’ fame and fortune in the Nigerian music scene. On the sprawling mansion located on Lola Holloway Street, Omole Estate in Lagos, a bold ‘For Sale’ sign hangs in front of the property. Findings revealed that the twin building with a swimming pool, underground basement, six living rooms, and ten master bedrooms, all fully furnished as well as other exotic features is up for sale at N320 Million. The brothers have several other properties in Lekki Phase One, Parkview Estate, Ikoyi, Atlanta Georgia and other choice locations.